In an emotional Facebook post, Union City Police Chief Darryl McAllister wrote, "Words can barely describe how embarrassed, dejected, and hurt my wife, daughters, and I feel right now." Image courtesy of Union City (CA) PD. A San Francisco Bay Area police chief wrote in an emotional Facebook post that his family is "shaken to the core" after his son was arrested in the beating of a 71-year-old Sikh man. 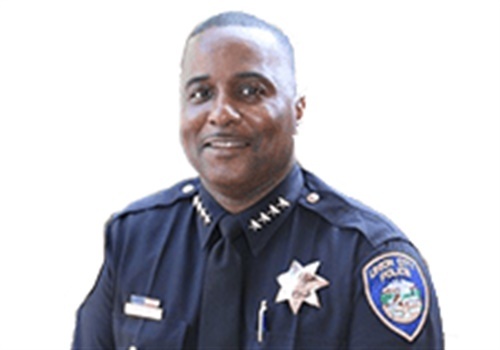 Union City Police Chief Darryl McAllister wrote, "By now you are probably aware of news stories about a 71-year old Sikh man was accosted by two young men as he innocently walked down a Manteca sidewalk next to a park. The two men confronted the man, apparently in an attempt to rob him, but when the elder did not cooperate, one of the men violently kicked the man in the chest, catapulting him to the ground, and then kicked him again several times as he lay defenseless on the pavement." McAllister went on to say that he is "completely disgusted in sharing with you that, later yesterday evening, I received a call from the Manteca PD that the suspect in this horrific crime turns out to by my 18-year old son." Tyrone McAllister, 18, and a 16-year-old boy could face charges including attempted robbery, elder abuse and assault following Monday's attack in the city of Manteca, which is about 40 miles northeast of Union City. Police said Sahib Singh — who doesn't speak English — was attacked while putting up campaign signs for local Republicans candidates in an upcoming local election. Chief McAllister said that his son has been estranged from the family for several months, reportedly having committed several theft-related crimes and spending several months in juvenile detention late in his childhood. "Words can barely describe how embarrassed, dejected, and hurt my wife, daughters, and I feel right now," McAllister said. "Violence and hatred is not what we have taught our children; intolerance for others is not even in our vocabulary, let alone our values. Crime has never been an element of our household, our values, nor the character to which we hold ourselves," he wrote.